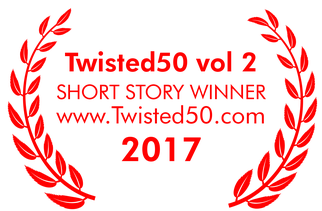 Congratulations to the fifty writers and their stories to be included in Twisted50 volume 2. Well done everyone! I shall look forward to reading it. OMG! OMG! OMG! I'm so excited! Well done to everybody as your stories are awesome! Incredibly stoked to be part of this with so many great writers and wonderful stories. Congratulations to everyone who got in and took part! Thanks ever so much for including me. You've cheered up my Monday. Every writer who took part is a winner as we've all inspired each other. OMG. I can't believe it! Seeing my name on the list is just... surreal. I can't thank you enough for this opportunity and confidence boost. Congrats to all winners and to all participants. Woohoo! This has made my day, thank you so much. Congratulations to everyone, all the stories are fantastic and I'm so excited to be involved in this project. Well done every one involved. Congrats to everyone! Super excited to see my story in this list. The competition was tough, so many talented people submitted. I hope everyone on the list or otherwise is proud of their effort! I'm amazed you lot can be so coherent so soon. The best I can manage is, Yay! Awesome. Can’t wait to read this book from cover to cover, twice! Congratulations all. Hey, so great to see some good writing pals on this list! Huge congratulations to everyone - it's a brilliant ride, enjoy it! Feeling awesome to make the cut. Well done to everyone and can't wait for the launch. Thanks Create50! So pleased to have made the list! Well done everyone. I am so looking forward to meeting this book in the flesh ! Delighted. Pleased to see so many writing buddies on the list. Well done all! Looking forward to seeing it in print! I checked at 12pm and saw I wasn't in (never thought to count whether 50 names were listed). Have just come back to say 'Well done' to everyone and saw my name in the list...! Talk about a Topsy-Turvy emotional few hours! Here's to website glitches and a big "Well done" to everyone! Wow! That’s amazing thanks so much for the support. So incredibly proud and happy to be part of this. Thank you for the opportunity ! Wow. I've won. What an honour given the quality of the stories. Congrats to the winners, commiserations to those not in the 50 but keep on going whatever. I now need to go and sit down for a while. So chuffed to be on this list with so many other writers I know. Congratulations everyone! Heady stuff! Well done folks - the standard is so very high. Well done to those chosen, commiserations to those that did not....this time.....but, stay on the bus!! Congratulations to everyone! So many great stories, whether they made the book or not. Everyone who is a part of Create50 has been a real contributor to the creation of excellent storytelling. So glad to share in that. Congratulations to all the selected #Writers. Commiserations to those not selected. Not making the cut this time doesn't mean your #writing is bad. Keep the faith and keep creating more of the great stuff you already do! Congratulations to everyone who took part. It couldn't have been easy choosing just 50 stories, so much talent. I'm thrilled to be included, thank you! Lovely to see so many familiar names in T50 vol 2. Congratulations to you all. Particularly good to see that one of the narrators from the audiobook of T50 Vol 1 has a story she wrote in Volume 2. Well done everyone. Congratulations to all of you! There are some really fine pieces of work here. Well done all, looking forward to Vol. 2 release and psyched to be a part of both books! Is there an update on Vol 2? Not heard anything for a while. Yes we are on it and aiming for a summer launch and release. We should be firming up this month. Right now we are all focussed on Impact50 too.